I love a good horror flick. Going all the way back to Kurt Russel and The Thing I love them all. 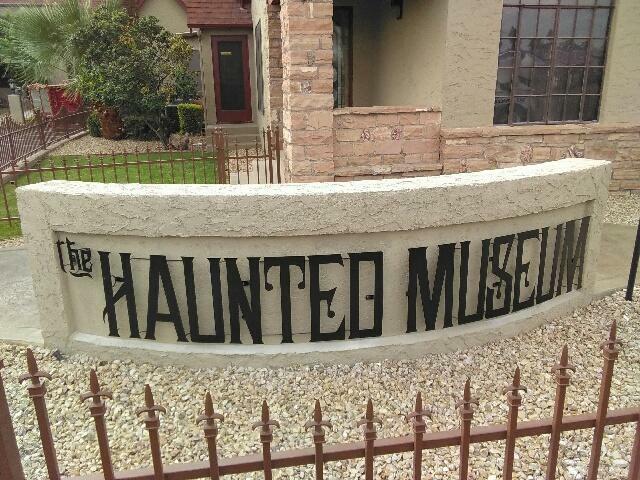 So when we got the call to help get Zak Bagans’ The Haunted Museum up and running, we jumped on it. There were all kinds of fencing tasks for this project. Everything from repainting the wrought iron around the perimeter to custom welding the main hand rails leading into the building. However, without a doubt, our favorite part of this job was the custom sheet metal fabrication for the Haunted Museum sign itself. My son Justin does quite a bit of the metal work for our Las Vegas jobs these days. Normally, I’d step back and let him have this one as well. But I love all things horror and I was not going to pass up this bit of sheet metal fabrication work. My favorite part of this particular custom metal fabrication was replicating the Museum’s logo for the sign at the front of the building. It’s a pretty specific symbol; of the museum. It appears not just on the front of the building but on all of the Museum’s marketing material including the website. There are a lot of attractions in Las Vegas and Zak Bagans has quite a following. So when visitors arrive at the The Haunted Museum at 600 East Charleston Boulevard, they are looking for visual clues to let them know they are in the right place. It feels good knowing that our sheet metal fabrication work will be standing there to greet them for many years to come. If you’re looking for an honest to goodness haunting experience within easy access to the Strip, stop in at Zak Bagans’ Haunted Museum. According to the owner, you an feel a definite spiritual presence when you visit the property, especially given its history. Of course, we’re not saying we had a little ghostly fence contractor help with some of our metalwork. We’re just not saying that we didn’t either.